Degree One Events: XZIBIT.. Collateral Damage Tour. West Coast Hip Hop Superstar, Movie Star & TV Personality... Mr. X to tha Z..... XZIBIT. 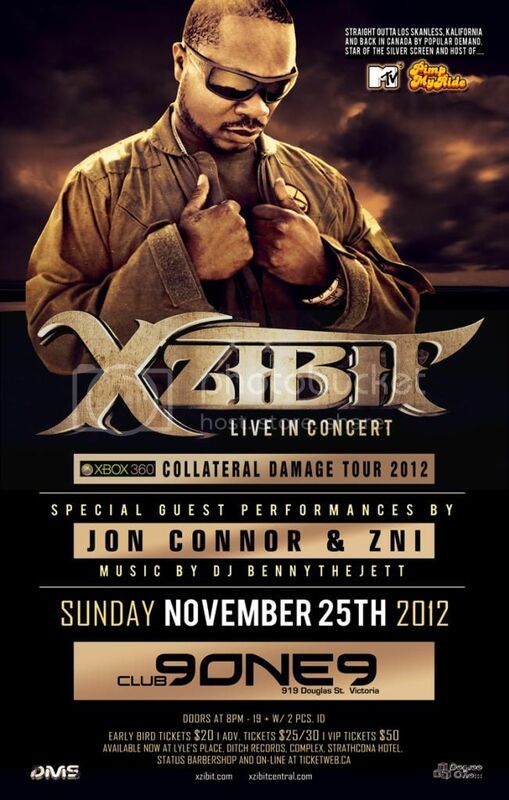 Xbox 360 Collateral Damage Tour 2012 ft.
w/ Jon Connor & Zni. Music by '2012 Victoria Urban DJ Of The Year'.... DJ BennytheJett. Early Bird tickets starting at only $20. Strathcona Hotel front desk (Club9ONE9) - 919 Douglas St.
Lyle's Place - 770 Yates St.
Complex - 612 Johnson St.